Posted on 2, June 2016 by EuropaWire PR Editors | This entry was posted in Automotive, Germany, Investment, Management and tagged Volkswagen Group. Bookmark the permalink. WOLFSBURG, 02-Jun-2016 — /EuropaWire/ — In the first quarter of the current fiscal year, the Volkswagen Group delivered a solid performance in a challenging market and competitive environment. Despite positive mix effects and an increased contribution by the Financial Services Division, Group sales revenue was down 3.4 percent on the strong prior-year figure, at EUR 51.0 billion. This slight decline is primarily attributable to the fall in vehicle unit sales and negative exchange rate effects. Operating profit climbed to EUR 3.4 (3.3) billion, with the reported figure equating to an operating return on sales of 6.8 percent. First quarter operating profit contained overall positive special items of EUR 0.3 billion, due among other things to currency-related adjustments to the provisions recognized in connection with the diesel issue. Excluding these positive special items, operating profit would have decreased slightly to EUR 3.1 billion. The operating return on sales before special items thus declined to 6.1 (6.3) percent. The Group’s sales revenue and operating profit do not include the operating activities of the Chinese joint ventures, which are accounted for using the equity method. The proportionate operating profit of the Chinese joint ventures amounted to EUR 1.2 (1.6) billion in the first three months. The Group’s financial result declined by EUR 0.9 billion overall to EUR –0.2 billion, with negative effects from the remeasurement of financial derivatives offset by income from the sale of the shares in LeasePlan, which was completed in the first quarter. Before tax, the Volkswagen Group generated profit of EUR 3.2 (4.0) billion; the pretax return on sales thus declined from 7.5 to 6.3 percent. Group profit after tax amounted to EUR 2.4 (2.9) billion in the first three months. “In light of the wide range of challenges we are currently facing, we are satisfied overall with the start we have made to what will undoubtedly be a demanding fiscal year 2016. In the first quarter, we once again managed to limit the economic effects of the diesel issue and achieve respectable results under difficult conditions. This shows that, with its portfolio of strong brands and its good position in many global automotive markets, the Volkswagen Group sits on very robust foundations. We can build on these when we now work towards modernizing our Group and positioning it for the new world of mobility”, said Matthias Müller, Chairman of the Board of Management of Volkswagen Aktiengesellschaft. Although the Automotive Division’s capex (investments in property, plant and equipment, investment property and intangible assets, excluding capitalized development costs) remained almost unchanged year-on-year at EUR 2.1 billion, the ratio of capex to sales revenue rose to 4.9 (4.5) percent due to the decline in sales revenue. We again invested primarily in production facilities, new models, the ecological focus of the model range, increasing drivetrain electrification and our modular toolkits. At EUR 1.3 billion, the Automotive Division’s net cash flow was up slightly compared with the previous year (EUR 1.2 billion), although it was positively affected by a EUR 2.2 billion nonrecurring gain on the sale of LeasePlan. Net liquidity in the Automotive Division amounted to EUR 26.0 billion at the end of March. It was therefore more than EUR 5 billion higher than a year earlier and around EUR 1.4 billion up on the 2015 year-end level. “Safeguarding the Volkswagen Group’s robust financial strength for the long term remains a top priority in light of the expected effects of the diesel issue. The higher net liquidity gives us the financial stability and flexibility we need to be able to manage the challenges still to come and to grow profitably. Nevertheless, we will continue to give top priority to disciplined cost management and to focusing our investments consistently on forward-looking topics”, said Group Board of Management member Frank Witter, responsible for Finance and Controlling. The Volkswagen Passenger Cars brand recorded a year-on-year decline in volumes and sales revenue in the first three months of the current fiscal year. As a result, its operating profit before special items fell to EUR 73 (514) million, while its operating margin was 0.3 percent in the first quarter. At EUR 1.3 (1.4) billion, Audi’s operating profit before special items was almost on a level with the strong previous year. Exchange rate effects and continuing high upfront expenditures for new products and technologies and for the expansion of the international production network had a negative impact on earnings. With sales revenue almost stable, the operating margin declined slightly to 9.0 (9.7) percent, although it remained at a high level. In the first three months of 2016, ŠKODA sustained the very encouraging performance seen in the previous year. Operating profit rose by just over 30 percent to EUR 315 (242) million due to positive mix effects and lower material costs. Sales revenue rose significantly, and the operating margin grew to 9.3 (7.6) percent. SEAT is on the path to long-term profitability and recorded further encouraging progress, improving its operating profit to EUR 54 (33) million on the back of cost optimization measures. This corresponds to 2.6 (1.5) percent growth in its operating margin. Bentley’s first quarter operating result declined year-on-year to EUR –54 (49) million, due to the decline in vehicle unit sales. Porsche remained on a successful trajectory at the start of the current fiscal year. Operating profit was up further to EUR 895 (765) million and thus rose at a much faster pace than sales revenue, which increased noticeably due to significantly higher unit sales. Its operating margin was 16.6 percent (15.1 percent). Operating profit at Volkswagen Commercial Vehicles declined to EUR 142 (165) million on the back of lower volumes, with the operating margin decreasing to 5.2 (6.1) percent. Scania posted a slight increase in operating profit to EUR 244 (237) million and a stable operating margin of 9.6 percent. Negative exchange rate effects were more than compensated by the higher vehicle sales and an expansion of the service business. In spite of the persistently difficult economic climate in South America, MAN Commercial Vehicles lifted its operating profit before special items to EUR 65 (–13) million due, among other things, to higher vehicle sales in Europe. MAN Power Engineering’s operating profit declined to EUR 48 (52) million. 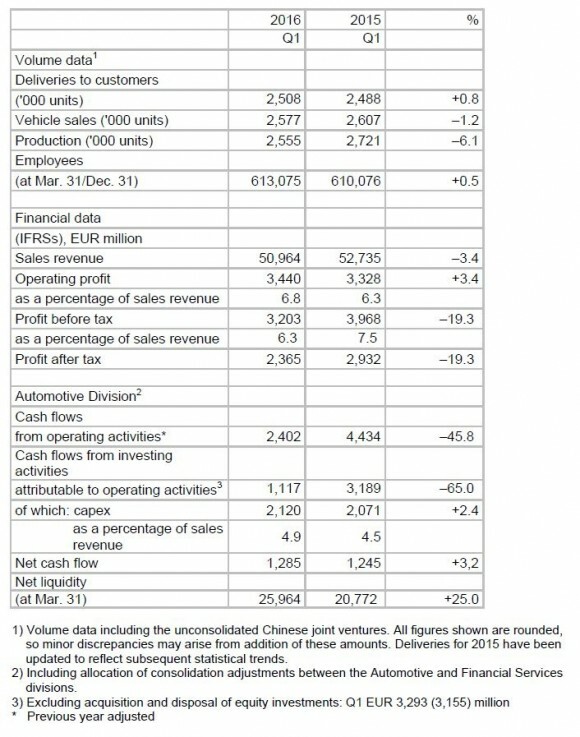 Volkswagen Financial Services increased its operating profit sharply to EUR 492 (403) million. Volume-related factors in particular had a positive impact. Following the solid opening quarter, which was in line with our expectations, the Volkswagen Group is reiterating its forecast for 2016 as a whole. Depending on economic conditions – particularly in South America and Russia – and exchange rate developments as well as against the backdrop of the diesel issue, the Board of Management expects 2016 sales revenue for the Volkswagen Group to be down by up to 5 percent on the prior-year figure. In terms of the Group’s operating profit, it anticipates an operating return on sales of between 5.0 and 6.0 percent in 2016. In the Passenger Cars Business Area, the Volkswagen Group expects a marked decrease in sales revenue, with the operating return on sales probably in the 5.5 to 6.5 percent range. With sales revenue in the Commercial Vehicles Business Area remaining essentially unchanged, the Company anticipates an operating return on sales of between 2.0 and 4.0 percent. For the Financial Services Division, we are forecasting sales revenue and operating profit at the prior-year level. “2016 will be a transitional year for Volkswagen that will see us fundamentally realign the Group. Nevertheless, we remain confident that our operating business will again record solid growth this year. The Group’s robust financial strength and earnings power are key to our ability to take the necessary decisions calmly and diligently, and to resolve the strategic policies that will shape our future with the necessary determination”, according to CEO Matthias Müller. ← MAN Truck & Bus AG invests $8.5 million in Silicon Valley based FR8 Revolution Inc.